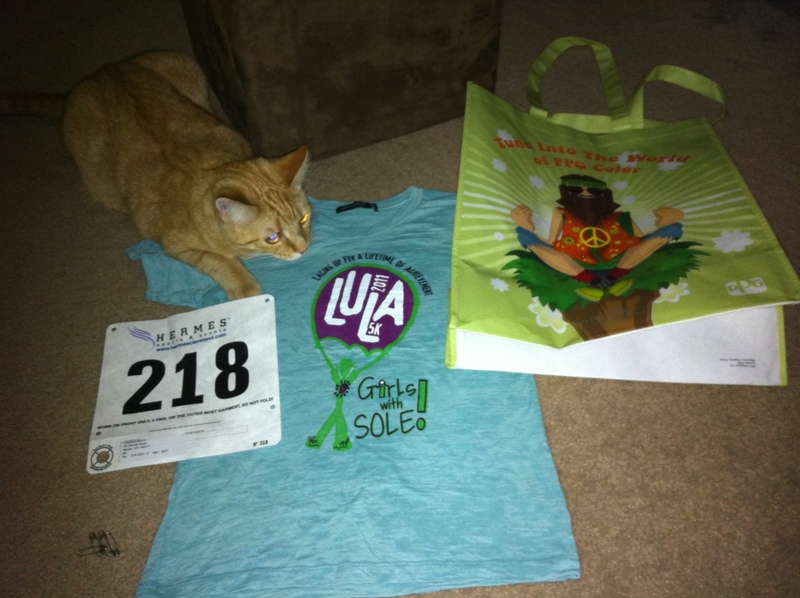 After work Friday I headed to Second Sole to pick up my race packet for the Girls with Sole 5k. I wasn’t expecting anything big, just a shirt and probably some info about the race. I was impressed with all that was included. We got a huge recyclable bag, candy, massage oil, coupons to some great restaurants around the area, and the shirt, which was a light cotton and true to its size. Other small things were included, but they weren’t as fun. I also may or may not have picked up a few small things for myself and future races. D and I also decided on more states for my 25 Challenge, mostly places that we know someone so we’d have a free place to stay. I’m looking forward to starting it next year. This year is all about Ohio and the beautiful state I call home 🙂 Saturday was the usual four hour morning class, followed by the new tradition of going to Fat Heads Brewery in North Olmsted. I’m obsessed with their Blueberry Ale, seriously so good. While we were there I kept seeing runners come in, drenched with sweat. Not so appetizing. The bartender told us that they do this each Saturday during the summer. A group of runners start downtown or near Cleveland and run from bar to bar, eating and drinking during their workout. How fun, right? Made me feel guilty that I hadn’t run yet, and was already planning on a nap once I got home. 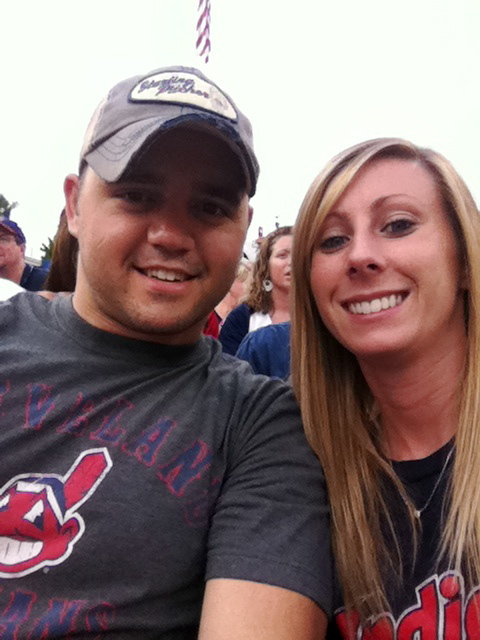 Saturday night we headed to the Jake to hopefully see the Indians win. Unfortunately they didn’t, but we saw some of D’s friends and as well as made an enemy. You can’t go to an Indians game, claim them as your team, and then bash them the whole night. Needless to say, it was one against many in our section. But it was a good time besides for the heat, and seats right behind Grady are totally worth it. I spent the next couple hours laying on the couch, not feeling like I had even ran earlier. I was still upset and knew I should have ran faster. I’ve been running and putting in the mileage. Looking back now, I knew part of it was the humidity. And after finding the results online, I feel a little better. I was 6th out of 25 in my age group, and times overall for everyone seemed to be much slower than most 5ks. I refused to let this race get the best of me, so I ended up doing extra miles on the treadmill that night. Looking into the future, I need to do more speed work, I need to get my times down or else I’m going to feel defeated. A year and a half later I’m still struggling with the mind game college times versus post college times. I’ve accepted the fact that I will never get down to my PR, but I have to keep going. I’m putting it in the past and focusing on my next two races. Winking Lizard and Huntington Duathlon. From here out, I’m getting much more serious. No worries about this race, the heat can do crazy things to runners. I always feel like it zaps out every inch of energy I have. They say it takes at least 10 runs in the heat and humidity to get used to it so you should be ready by the winking lizard race!